Where are you from? Where do you live? They are the two most popular questions to ask travellers, party guests, and game show contestants. The answer allows a stereotyped categorization. It can spur a conversation or, perhaps, the decision to not bother starting one. It’s odd though, because while often seen as the same question they are two totally different inquiries. Ask yourself the two questions. Do you get two answers? I am from Hamilton. It is known as Canada’s steel town although with the slow death of the industrial revolution the nickname means less all the time. Home to Huron, then French, and then British settlers, it is named for Robert Hamilton, a War of 1812 veteran, who built his estate at the west end of Lake Ontario. The place grew quickly as railways passed through on their way from the American border to Toronto. The pig iron plant arrived first. Then came the Steel Company of Canada (Stelco) and then, the smaller Dominion Foundry and Steel Company (Dofasco). My great grandfather was among Dofasco’s first employees. He got my grandfather into the foundry and he worked there for over 40 years. He never said a bad word about Dofasco. He always spoke of the bosses as Mr. This and Mr. That. My father worked there too. He tells stories of playing in the Dofasco baseball league and bowling league and hockey league. I recall as a child going to the Dofasco Christmas party. It was a massive affair where an entire building was emptied and then opened for the thousands of employee families. There were treats and games and Santa Claus and a wrapped present for every kid. Stelco is gone now. 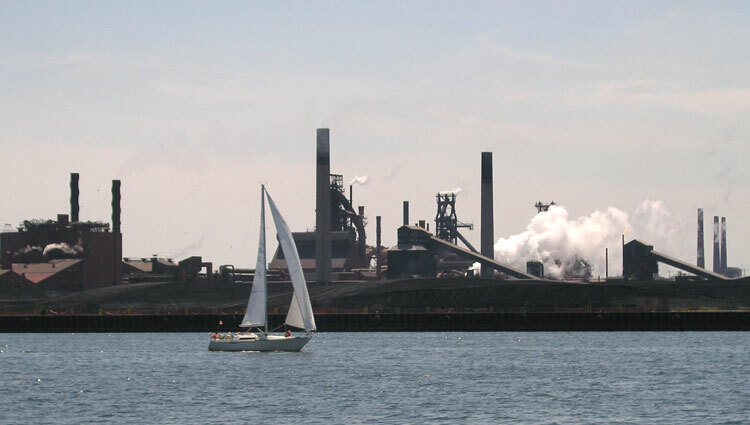 Dofasco is all but gone too. Their shadows remain but they were bought and sold a couple of times and are now just cogs in transnational corporations with no ties to Canada let alone the city. Corporations may be constitutionally people but they neither have a home nor care much about those who do. With the steel plants went the others. Hamilton is not the same. Go to any city. Go downtown near the river or the harbour at the lake. You know the places I mean in whatever city has entered your mind. The big old buildings are nearly all empty. Or they have been turned into fancy boutiques, offices, or condominiums. The places to shop and eat are elsewhere and everywhere the same as everywhere else. You can picture that street too can’t you? Walmart, Costco, McDonalds, and the Tims have taken care of it. Online shopping took care of what remained. So that is where I am from – a ghost. I still have family there, I’m a proud McMaster University alum, and a great deal remains that I find invigorating and beautiful. But it’s a city re-inventing itself as surely as when Robert Hamilton created it in the first place. It will succeed. There are too many good people for it to fail. No one is sure how just yet, but a consensus will grow. It will enable enough people to recognize that a city, like a well-lived life, is not about money and stuff. A community rests on shared values and the places where people from up and down and across town meet to enjoy the same things at the same time. Hamilton, and for that matter every city that is going through the same period of existential angst, will come out the other side when enough people say enough to driving out of town to have fun and to driving past boarded up shops once owned by folks they knew to stores the size of football fields to save fifty cents on toilet paper. The city will begin to move when people move by getting out of their cars and walking. When people start to walk they will need some place close to walk to and some version of Walmart won’t put a store there, or a book shop, or a pub – but a neighbour might, in an actual neighbourhood. In walking, neighbours will start talking and the rest will take care of itself. It won’t be easy, but then Robert Hamilton didn’t have it easy either. Where I live is different. I live in a village of 2500 people called Lakefield. Lakefield was created on Ojibwa land just a few years later than Hamilton. It became known not for stinky steel but silent canoes. It was home to several canoe manufacturers including Walter Walker who made canoes and paddles for ordinary folks and royalty with the same dedication to excellence. It has always been an artistic place. Catherine Parr Traill and Susanna Moodie lived and wrote in Lakefield as did Margaret Laurence. The Leahy band lives nearby as does Rompin’ Ronnie Hawkins. First-rate painters, children’s book authors and illustrators, and sculptors call Lakefield home as do highly respected architects and film makers. The Lakefield Literary Festival and world-renowned Lakefield College School are here. A river runs through the centre of my Village and it is only right that it does. It is a metaphor that speaks of perpetual movement and things that never change. Margaret Laurence wrote The Diviners here and, if you recall, the novel begins by speaking of a river that runs both ways. It does you know. It really does. 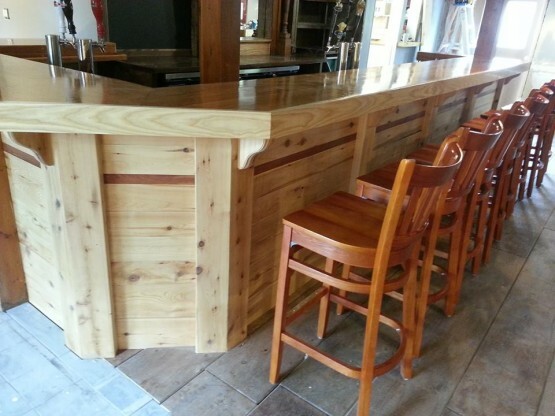 Last week a new pub opened in Lakefield called the Canoe and Paddle. It is fashioned to reflect the look and feel of a pub one might wander into on an English afternoon or Halifax night. It is owned and run by folks from the village. Last Thursday my little rock band played the pub’s first night of music. It was music for neighbours by neighbours. Last night I walked across the bridge to stand with a pint and enjoy a Celtic band play one lively reel after another. The place was packed. As I looked around the room I realized that I knew nearly every face. Everyone glowed with the happiness of a Saturday night among friends, with neighbours, and in a community that understands the meaning of the word. The pub will do well. The Canoe and Paddle has reminded us that we understand what doing well means. Hamilton is where I am from. Lakefield is where I live. It’s good to be home. If you enjoyed this, please share it through social media with others and consider following my blog where I post every Monday morning at johnboyko.com.